Christian Faith is one of the most important works of Christian theology ever written. The author, known as the "father of theological liberalism," correlates the entirety of Christian doctrine to the human experience of and consciousness of God. A work of exhaustive scholarship written in deep sympathy with the ministry of congregations and church bodies, Christian Faith has inspired admiration and debate from all quarters of the Christian family since its first publication in 1821. 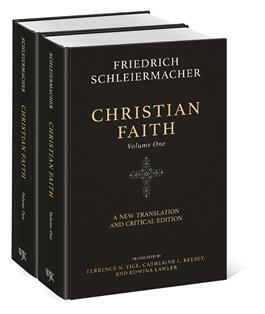 This is the first full translation of Schleiermacher's Christian Faith since 1928 and the first English- language critical edition ever. Edited by top Schleiermacher scholars, this edition includes extensive notes that detail changes Schleiermacher made to the text and explain references that may be unfamiliar to contemporary readers. Employing shorter sentences and more careful tracking of vocabulary, the editors have crafted a translation that is significantly easier to read and follow. Anyone who wishes to understand theology in the modern period will find this an indispensable resource. "What a tremendous contribution to twenty-first-century Friedrich Schleiermacher research and studies. This is the ultimate English translation of one of the most important dogmatic presentations of Christian faith and witness in history. The editorial notes, interpretative nuances, and language clarity is a real gift for current and future Schleiermacher scholarship." "Until now Schleiermacher's Christian Faith has been available to English-speaking readers only in its largely outdated 1928 translation. This much-anticipated critical edition provides a discerning, diligently researched, and well-organized new translation that takes special care to remain faithful to the rich complexities of Schleiermacher's own prose. The meticulous notes further situate Schleiermacher's work among his own interlocutors and relate his insights to ongoing and contemporary scholarly conversations. These volumes present a significant and welcome contribution that will quickly become a standard point of reference for Schleiermacher's thought for specialists and nonspecialists alike." "The availability, for the first time, of a consistent English translation of Schleiermacher's masterpiece is a great boon to scholars and students. Tice, Kelsey, and Lawler deserve our gratitude for the almost unimaginable labor required to produce these volumes. Readers will find the substantial notes, which provide orientation and historical context, not only useful but engaging. This marks an important moment in Schleiermacher scholarship." "This magisterial and authoritative English translation and edition of Friedrich Schleiermacher's Christian Faith (1830) constitutes a major contribution to the study and understanding of modern Christian theology. Undertaken by the foremost interpreters and translators into English of Schleiermacher's work, Terrence N. Tice, Catherine L. Kelsey, and Edwina Lawler, this superb work will change the way in which the English-speaking world understands how one of the most important modern theologians conceptualized and defined the very nature of Christianity in the modern era. An indispensable achievement of translation and religious scholarship, this work should become a standard in libraries, institutional and personal. Providing an English translation of the 1830-31 reworked second edition of Schleiermacher's text, the editors make full use of the critical apparatus of previous German and English editions of Christian Faith. Following Schleiermacher's own theory of translation, the language is clear, expressive, eminently readable, and accurate. In addition, all of Schleiermacher's own notes in Greek and Latin are translated and, where possible, identified. Inviting the twenty-first-century reader to engage with the thought of Friedrich Schleiermacher in an unprecedented way, this work constitutes a magnificent lifelong achievement of philological and theological scholarship." "This translation of Friedrich Schleiermacher's Christian Faith is a stunning achievement. It is now not only the definitive edition of this work but the standard for all future Schleiermacher translations. Christian Faith is the most famous theological text of the past two hundred years. The translation, grounded in the translators' deep learning, renders Schleiermacher's text in language that speaks with immediacy and clarity to contemporary theological questions and concerns. The translation is so beautiful and faithful that I swear I heard Schleiermacher's own voice speaking through the text!"